Vietnam Airlines on February 1 rolled out its new domestic route connecting the Mekong Delta city of Can Tho and the central city of Da Nang. The carrier will operate seven flights per week on the route using Airbus A321 aircraft with four-star service onboard. The flights take off from Da Nang at 18:30 and Can Tho at 7:15 every day. On the occasion, Vietnam Airlines has run a promotional programme, with economy fares priced from 299,000 VND (12.97 USD) excluding tax and fees. The discount tickets are on sale between January 9 and February 3 for trips between February 13 and March 31. 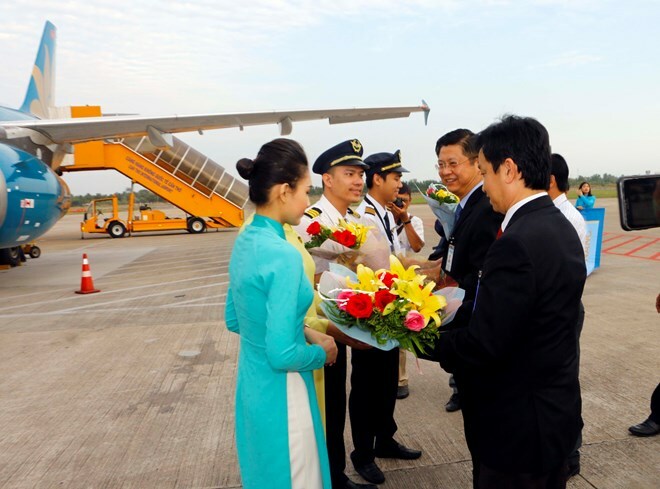 At the launching ceremony held at Can Tho International Airport, Dang Minh Viet, head of the airlines’ branch in Can Tho, said the route will boost connectivity between the Mekong Delta and localities in the central region, catering to increasing demand for travel and business. Vice Chairman of the Can Tho People’s Committee, Truong Quang Hoai Nam highlighted the importance of the route, noting that Can Tho has strength in eco-tourism, while Da Nang has a strategic location in terms of development and defence-security. The official expected that the carrier will soon launch routes linking the Mekong Delta city with the north-eastern area of the northern region, north central region and Central Highlands. The route is the fourth among domestic ones operated by Vietnam Airlines at the airport, apart from the Can Tho – Hanoi, Can Tho – Phu Quoc, and Can Tho – Con Dao routes. Vietjet Air was the first to launch flights on the Can Tho – Da Nang route in 2014.